Son of the famous Perlato di Sicilia, the Perlatino di Sicilia is a variety of marble that has nothing to envy to its closest relative. The difference with the Perlato di Sicilia consists essentially in color gradation and minimal variations in technical requirements. The versatility of use makes it perfect for many types of indoor and outdoor installations. The main deposits of Perlatino di Sicilia are located in the area of Custonaci, in the province of Trapani, which boasts the presence of numerous quarries of this refined variety of Sicilian marble. Thanks to its shiny and shiny appearance, Perlatino Siciliano is extremely elegant, without losing the fundamental feature of its functionality, typical of the whole family of Sicilian marble. 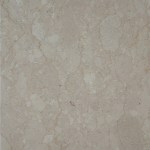 The Perlatino di Sicilia is a fossiliferous limestone that presents an elegant beige background with clearer blotches of pure calcite. The veins, with variations of colors from white to orange, are accompanied by the remains of small fossil shells that give rise to brown spots and make this type of marble exceptionally elegant. To the aesthetic taste are added technical, physical and mechanical features that greatly expand the field of use, making it perfectly suitable for both external and internal applications. For urban and domestic furniture that combines practicality and good taste.